$dia->showname('Xb dim'); # "X flat diminished"
A Music::FretboardDiagram object draws fretboard chord diagrams including neck position and chord name annotations for guitar, ukulele, banjo, etc. A chord given as a string, where non-zero digits represent frets, x (or X) indicates a muted string and 0 (or o or O) indicates an open string. The default order of the strings is 654321 from lowest to highest. The neck position of a chord to be diagrammed. 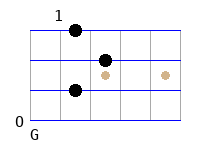 This number is rendered to the left of the first fret in vertical mode. 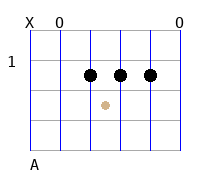 When drawing horizontally, the position is rendered above the first fret. The relative size of the diagram. The image file name minus the extension. The TTF font to use when rendering the diagram. An arrayref of the string tuning. The order of the notes is from highest string (1st) to lowest (6th). For accidental notes, use flat (b), not sharp (#). Draw the diagram horizontally. That is, with the first string at the top and the 6th string at the bottom, and frets numbered from left to right. Return the image from the draw method instead of writing to a file. The diagram finger position dot color. A hashref of the string notes. This is a computed attribute based on the given tuning. Show a chord name or not. Sometimes the computed chord name is not that accurate or desired. In those cases either set the showname to a string of your choosing before drawing, or to 0 for no chord name. Monitor the progress of the diagram construction. Create a new Music::FretboardDiagram object. Construct the fretboard attribute from the tuning. Render the requested chord diagram as an image file of the given type. This software is copyright (c) 2019 by Gene Boggs.